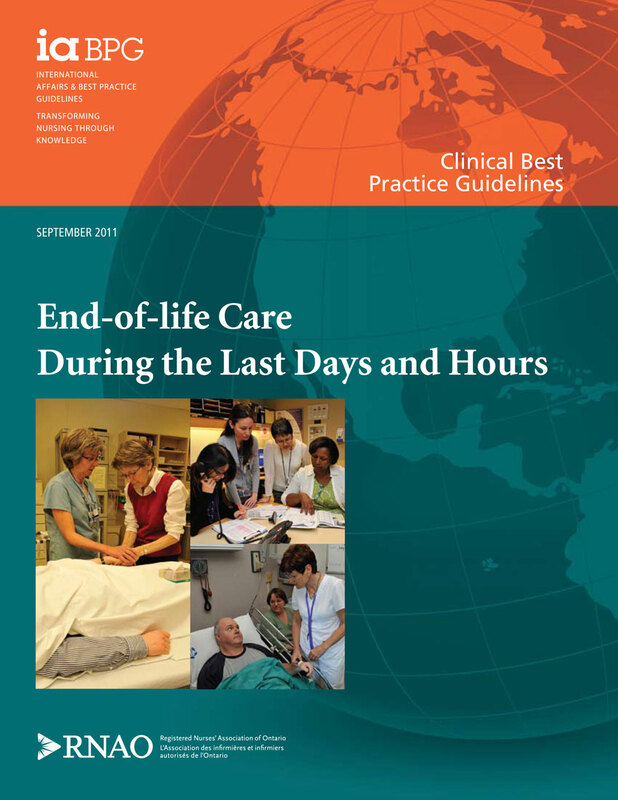 The purpose of this best practice guideline is to provide evidence-based recommendations for Registered Nurses and Registered Practical Nurses on best nursing practices for end-of-life care during the last days and hours of life. The guideline does not replace consultation with palliative care specialists, who can support nurses to provide quality end-of-life care. 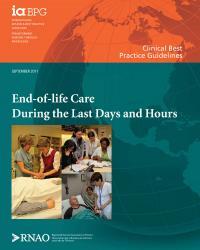 The guideline is intended to be a resource to nurses who may not be experts in this practice area. It is acknowledged that individual competencies vary between nurses and across categories of nursing professionals. The inclusion of recommendations on clinical, education, organization and policy topics makes this guideline applicable to nurses in all domains and settings of practice. What knowledge and skills do nurses require to identify and assess individuals and families during the last days and hours of life? What knowledge, skills and tools do nurses require to support individuals and their families in making informed choices during the last hours and days of life? What palliative interventions are needed to address the experiences faced by individuals and their families during the last days and hours of life? What supports are needed to assist nurses in providing high-quality care in the last hours and days of life? In developing this guideline, we are mindful that the scope of the guideline does not permit an in-depth review of care of individuals dying from particular illnesses and associated issues. Nor does it allow for a comprehensive examination of all elements included in the CHPCA Domains of Issues. Moreover, the focus of this guideline precludes extensive review of issues pertinent to the provision of hospice palliative care across the trajectory of life-limiting illness (Figure 3). Therefore, the development group selected the most common issues encountered by individuals and their families during the last hours and days of life.